I've held off on publishing a "Manual Stimulation" post devoted to this popular single-screen platformer until now for one simple reason: it's nowhere near as impressive as it should be given how charming and colorful the on-screen action is. 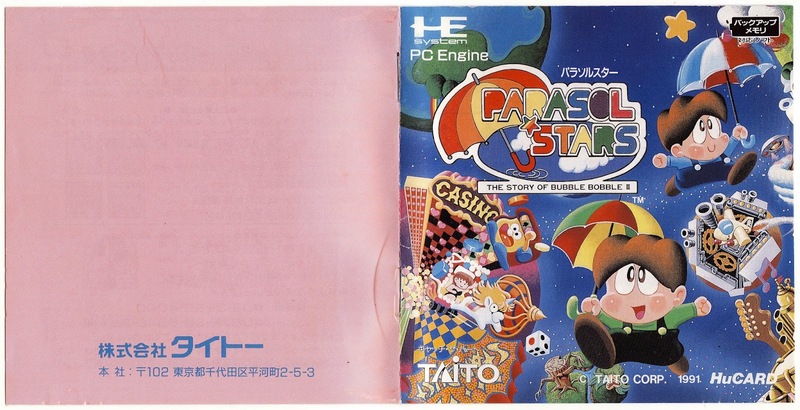 Sadly, the cover of Parasol Stars' manual is both of those things (charming and colorful) and then some. All of that is washed away, though, as soon as you flip it open. 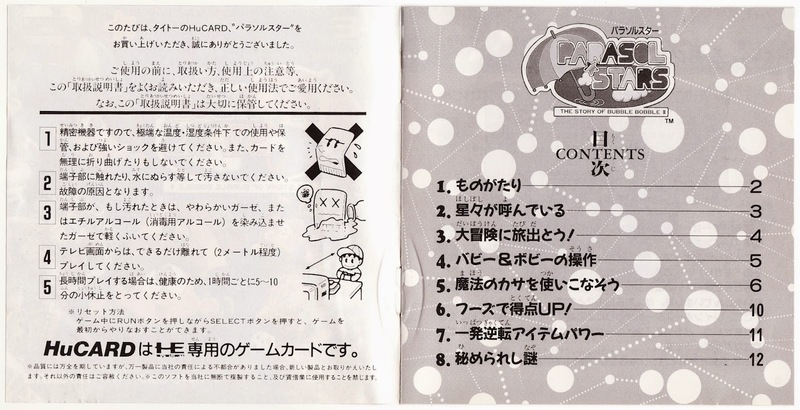 That said, I guess you could say the bubble-inspired header that tops every interior page of this PC Engine manual is a nice, although hardly stellar, addition to the proceedings. 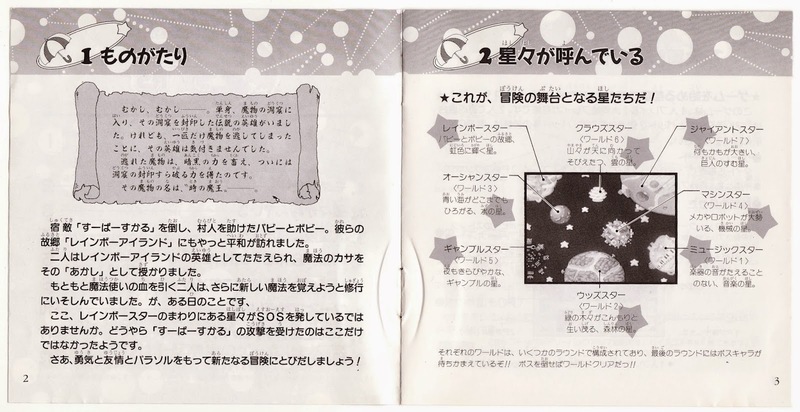 Other aspects of its layout are similarly appealing, such as the scroll that shares the game's story and the stars that call attention to descriptions of its many stages. 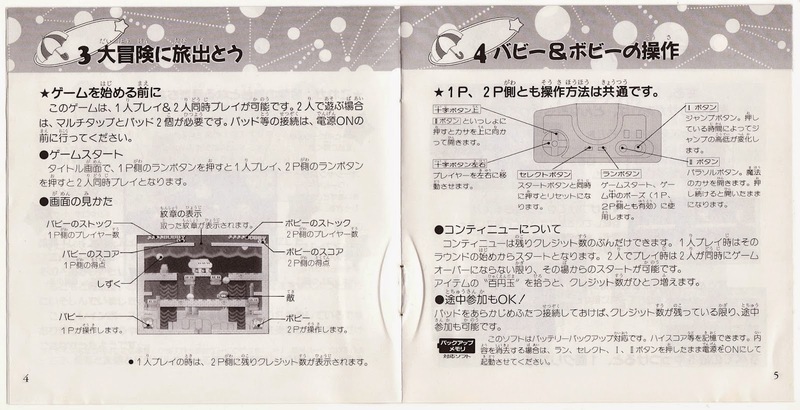 Aside from the above, though, it seems kind of wrong for a manual like this one to feature black-and-white screenshots, don't you think? 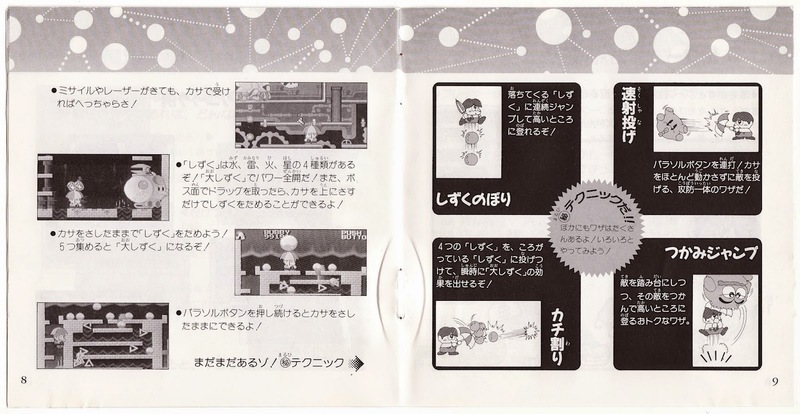 It does feature a few illustrations, at least, although they pale in comparison to the ones found in similar Taito efforts, such as the manuals the company produced for some of its other arcade-to-PC-Engine ports like Don Doko Don, The New Zealand Story and Mizubaku Daibouken. In honor of that milestone, I thought it might be nice to take a little Dreamcast-focused trip down memory lane. 2. I sold my Japanese Saturn and games to pay for it--As much as I love my Dreamcast and the handful of games I've since acquired for it, I have to admit that I now regret this decision--or at least consider it to have been a somewhat questionable one. 3. The system's design is what made me want the system--What can I say? 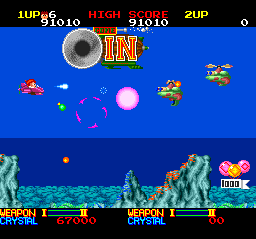 It reminded me of NEC's PC Engine, which has long been my favorite console, aesthetically speaking. 4. Well, that and Sonic Adventure and Power Stone--Coming from the era that gave us the Nintendo 64, the PlayStation and the Saturn, these launch-day games looked positively futuristic to my young-ish eyes. I remember being especially entranced by Capcom's arena-based brawler. 5. I've never played Sonic Adventure, by the way--I'm not exactly sure why, unfortunately. Were reviews not so kind to this ambitious release? If so, that's likely the reason. Or maybe the other games I picked up at launch were enough to satisfy me? 6. I've also never owned or played Skies of Arcadia--Given my love of the RPG genre, and the praise that's often heaped upon this Overworks-developed title, that's sure to be a shocking revelation for some. I know it is for me. 7. Nor have I owned or played Samba de Amigo--Actually, this may be an even more surprising disclosure than the one above. I have a feeling the rather pricey (even back then) maraca controllers are what kept me from picking up a copy. 8. Worst admission yet: I also haven't owned or played Seaman--I mean, really--given the name of this blog, I should've at least played a game called Seaman, right? Seriously, despite the fact that this odd "virtual pet" has intrigued me since it first traipsed onto my radar, I've never experienced it firsthand. Maybe I'll rectify that sometime next year. 9. I've spent very little time with Shenmue despite liking what I've played of it--Here's another head-scratcher, or at least I think it is. At least there's a somewhat acceptable explanation for this one--that being that my older brother took this game and a few others (SoulCalibur being one, and Power Stone possibly being another) with him when we stopped sharing an apartment many, many years ago. As for why I've failed to buy a replacement copy in the ensuing decade or so, though, I can't say. 10. I'm pretty sure I've never imported a Dreamcast game--I say "I'm pretty sure" here because my memory's a bit foggy when it comes to this subject. Assuming that's the case, though, this is one of the few instances where I haven't bought even a single Japanese game for a system I still own. Don't worry, I plan to change that soon enough by picking up one or all of the following Japan-only Dreamcast titles: Boku no Tennis Jinsei, Net de Tennis, Lack of Love and Segagaga. 11. Oh, and Space Channel 5: Part 2 as well--Sadly, I'm pretty sure acquiring this 2002 release is going to set me back a pretty penny--although maybe not as much as copies of the aforementioned Lack of Love and Segagaga are likely to cost me? Regardless, it'll be worth it, especially when you consider the following. 12. The original Space Channel 5 title is one of my all-time favorite games--I could play it over and over and over again and never become bored with it. In fact, I've done just that since first bought this fabulous rhythm game some years ago. 13. I don't believe I ever took my Dreamcast on line--I'm not entirely sure why that is, although I think it may have had a little something to do with the fact that the only online-enabled Dreamcast game I've ever owned is ChuChu Rocket!--which I didn't buy until a number of years after the system had exited the market. 14. 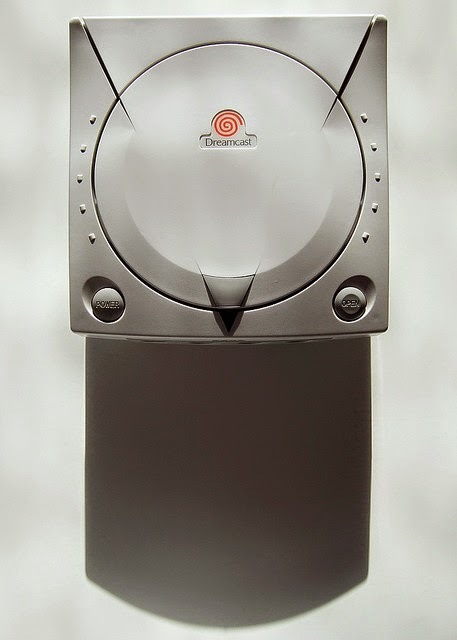 I've never used a VMU to do anything other than data storage--In other words, I've never used it to play any of the mini-games that were included on a number of Dreamcast discs. Granted, a quick glance at this list suggests I own just a handful of titles that offer VMU support, so I guess I shouldn't feel too bad about this oversight. 15. 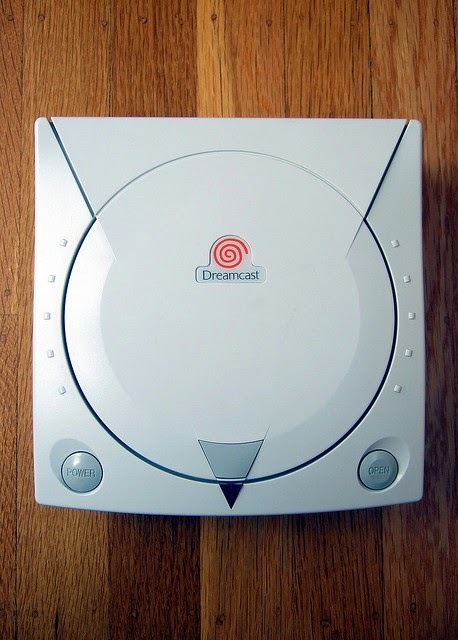 I am determined to own one of the pink Hello Kitty Dreamcast systems before I die--In fact, maybe I'll make it a goal to check this off of my lengthy gaming wish list sometime in 2015. Do any of you have fond (or otherwise) memories of Sega's final system? If so, please share them in the comments section of this post. 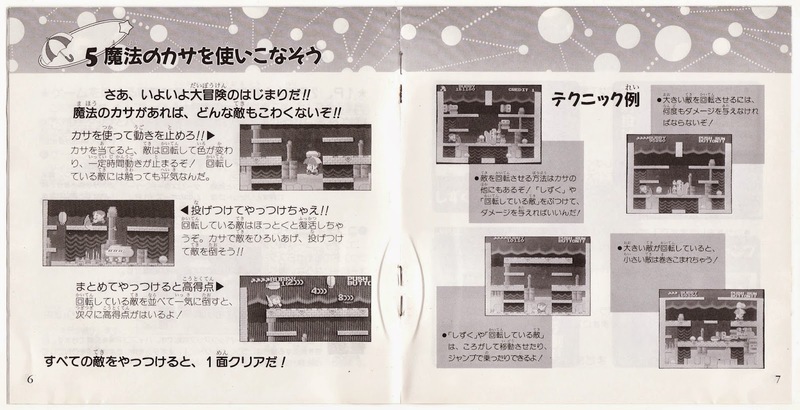 Is the "Duck Hunt Dog" really going to be included in Super Smash Bros. for 3DS and Wii U as a playable character? I have no idea, of course, but I can't help but hope the rumor that suggests he's going to make a noteworthy appearance in the above-mentioned pair of games proves to be true upon their release. 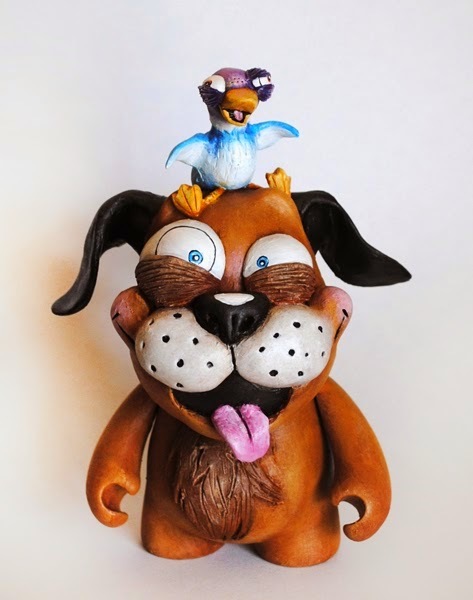 I can't say with any certainty that artist One-Eyed Girl (aka Kasey Tararuj) is as interested in all of this as I am, but I wouldn't be surprised to hear that she is, especially after coming across the adorable creation below. Tararuj's take on the "Duck Hunter" was included in the "8 Bit and Beyond 2" show recently presented by the Bottleneck Gallery in Brooklyn, New York, by the way. Sadly for any of us who'd like to own one of these "custom bubs," and happily for Tararuj, the one showcased above was snapped up by some eagle-eyed gallery-goer. Oh, well, at least we can take in the photos that can be seen here. You may have noticed--you know, by reading this recent post, as well as this one and this one--that I'm on a bit of a Taito kick as of late. Granted, I've been interested in this now basically defunct developer and publisher--and its output, of course--since I first came across a Bubble Bobble cabinet in the arcade that was tucked into the corner of my hometown's bowling alley as a teen, but recently I become even more of a Taito fan. There's no particular reason I can point to for this increase of affection--other than I've played and written about a bunch of Taito-made games (Bubble Bobble, Don Doko Don, Insector X and Rainbow Islands among them) in the last week or two, I mean. Anyway, as a result, I'd really like to delve even deeper into this Tokyo-based company's catalog. 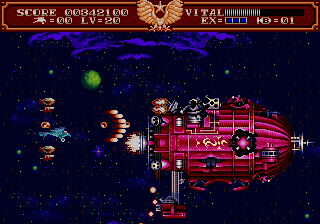 The thing is, though, I've already spent time with a good number of the games it released for my current favorite systems, the Famicom (NES), PC Engine (TurboGrafx-16) and GameBoy. 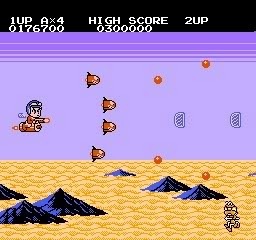 Specifically, for the Famicom I've played: Bubble Bobble, Bubble Bobble 2, Chuka Taisen, Don Doko Don, Don Doko Don 2, Elevator Action, Insector X, Rainbow Islands and Wanpaku Kokkun no Gourmet World (aka Panic Restaurant in the West). When it comes to the company's PC Engine titles, I've played: Darius Plus, Don Doko Don, Gokuraku Chuka Taisen, Hana Taka Daka! ?, Jigoku Meguri, Kiki Kaikai, Mizubaku Daibouken, The New Zealand Story, Parasol Stars and Rainbow Islands. Finally, I've played two Taito-made GameBoy carts thus far, with the pair in question being Bubble Bobble and Bobble Bobble Junior. Should any of you have any Taito-focused recommendations--especially for the aforementioned systems--to share, I'd love to hear them. 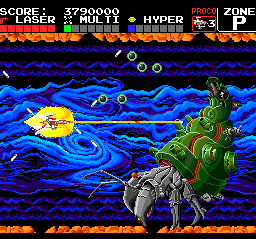 To help get you started, here are a handful of the company's games I've been curious about for some time but have yet to experience: Cadash (PC Engine), JuJu Densetsu (Famicom), Power Blazer (Famicom), Sagaia (GameBoy) and Taito Chase H.Q. 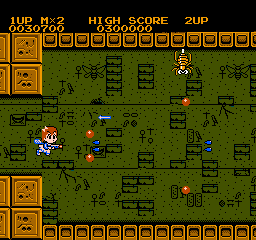 (PC Engine).